• Multiple uses. All-purpose Poly Pads are ideal for cage liners, necropsy liners and pads for animal post-surgical recovery areas. 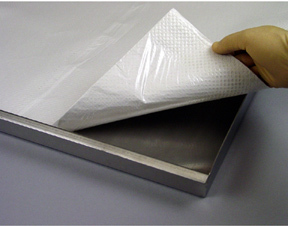 They are also widely used as bench liners and as lining material for radioactive or hazardous substances work areas. • Super absorbency. Multi-layered for increased absorbing action, Poly Pads can easily soak up heavy discharge from large animals such as rabbits and guinea pigs. 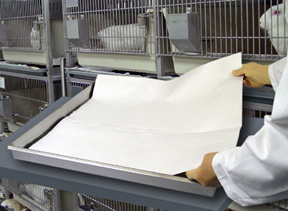 Or in laboratory situations, the extra absorbency of multiple layers effectively handles spills. • Special wicking action. No puddling or runoff with Poly Pads. The capillary action of their several layers spreads moisture throughout the sheet. • Dust elimination. Made from 100% virgin fibers, the absorbent layers of Poly Pads will not create dust-a chronic problem. • Greater economy. Higher absorbency means longer life. And that translates into lower costs and fewer replacements in either cage or bench maintenance. • Quick, easy observation. They are made from white tissue which makes animal discharges and lab spills readily noticeable.